As you know, GOSH is a brand I am very much in love with, but do not actually buy a lot of in store. When I was sent some lip products to review (all opinions are honest), I got very very excited. I wasn't too excited about this Lip Marker though, as I had heard so much about how drying lip stains were etc. etc. etc. This one, is drying. Though, there is no issue with it once you have lip balm under and over it. It smells really nice, which is unusual for a stain, and it also tastes as good as it's scent (sweet, but a little fruity?). Sorry about the such dull looking pictures, I haven't added any contrast to them, as I didn't have time. So, the one this I do not like about this product is that it is patchy, especially when it is first applied. 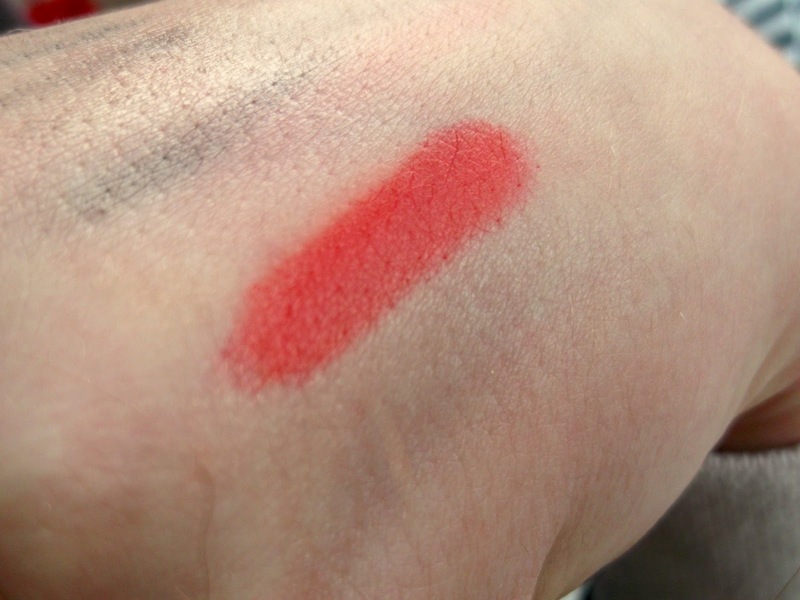 I can work with it, but as shown on the lip swatch, it is pretty difficult to get it perfectly even. For me, red isn't a colour I wear regularly, as with any bright colour, but I am try to branch out more this season. As you can see, it is a little patchy, and does bleed in some areas. But the colour is very pretty. It is a vibrant cherry red, and I do really like it with a red GOSH lip gloss over the top, and it definitely makes the product less drying. I wouldn't recommend this product if you do always have dry lips, and I will not be wearing this in winter, because lip stains plus chapped lips probably will not be good. But in the summer, this will me AMAZING for some sweat proof makeup, as I swatched this on my hand, and after 2 showers, a bath and many many thorough hand washes, it finally faded! 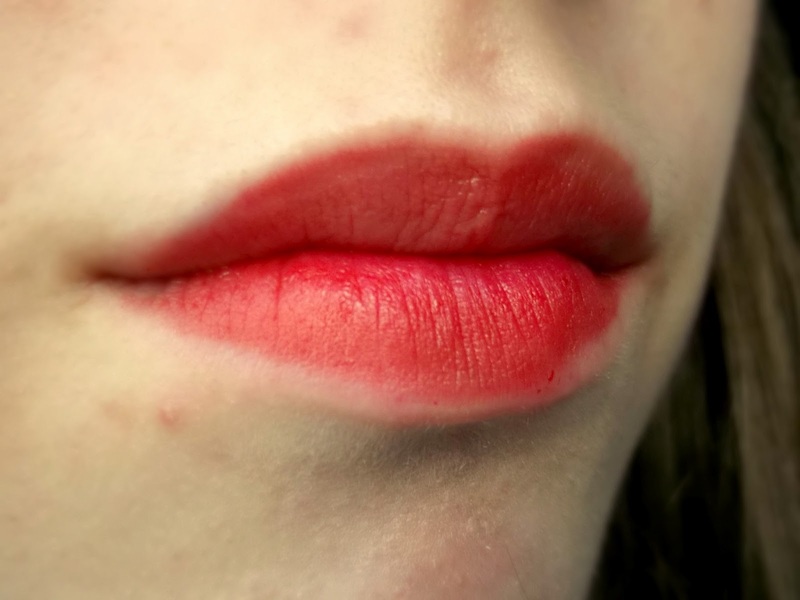 What do you think about lip stains? P.S - If I could all ask you a favour, it would be great if you call all follow via Bloglovin' as GFC over their will soon be going and you will not be able to keep up to date with my blog, and I will have a lot less viewers. Thanks guys, there is a button below, and also to the right! If you can't remember, in my last post, I mentioned that I bought some disco pants from Primark! I am very, very excited, as I have been lusting after disco pants for quite some time. I was planning on buying the Topshop ones, but this way I saved £14 for a pair that is near enough identical in quality, and look lovely aswell. By the way, a huge thanks to Megan for photographing these! So, as you can see, these are pretty shimmery, especially outside. They have a gunmetal button, which I like. They are a little long on me, but that's why I bought a size up, so I can grow into them. They are also a little baggy at the knees, but to be honest, me and Megan decided that we both lack in 'knee fat' so that's probably why, haha. As you can see, the knee wrinkles disappear as I sit down, but they get a little baggy at the 'crotch' area, if that's the normal way to describe it?! But I don't mind. I have been wearing these disco pants a lot since I have got them, which is actually only a few days. (in this picture, I rolled up the bottoms, I like to wear them that way). Compared to the Topshop ones, these are a lot less soft. If I had to describe it, the Topshop ones are like thicker leggings, and the Primark ones are like thin trousers. Do you understand what I mean by that? I'm not sure if I described it very well. Either way, I think both are great, and if I could have both, I would. I know Megan wants to pick up these ones as an emergency/backup pair. Do you own any disco pants? Let me know in the comments! So, I may sound a little overexcited in this post, as I am very hyper after just managing to pick up my own pair of disco pants from Primark! Eeep! So, yeah. That happened. I will be doing some upcoming posts on ways I wear my disco pants, and also I may be doing a comparison between Topshop ones (belonging to Megan) and my Primark ones at some point. I have always been a fail at applying winged liner, because I don't have a proper eyeliner that works. I saw on a youtube video that you could use some mascara and an angled brush to create the wing, and thats what I did! For my brows, I used Tease from the Urban Decay Naked 2 palette. For the liner, I used Blackout from the same palette, and then went over it with and angled brush and Maybelline the Falsies Waterproof. On the waterline I used a Bourjois Smokey Effet liner in Sparkling Granite, which is a navy glittery liner, but the glitter doesn't show too much. I also used some of the Avon Glimmerstick in Blackest Black over it to deepen it up. For actual mascara, I used the Sheer Cover Extra Length Mascara in Black/Brown, which I find does an AMAZING job of adding length. As a base, I used the MUA Pro Base Eye Primer, which I love. Then for my base colour I used Bootycall from the UD Naked 2 palette, and then I used a teeny tiny amount of Suspect on the outer third. 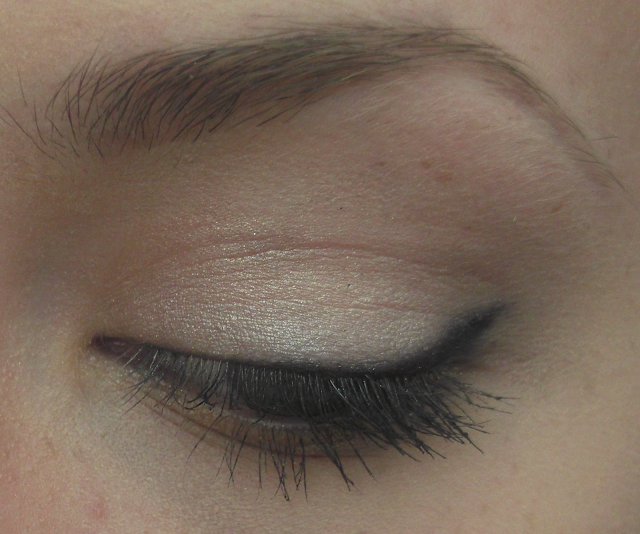 I then worked a small amount of Tease into the crease, to add slight dimension. 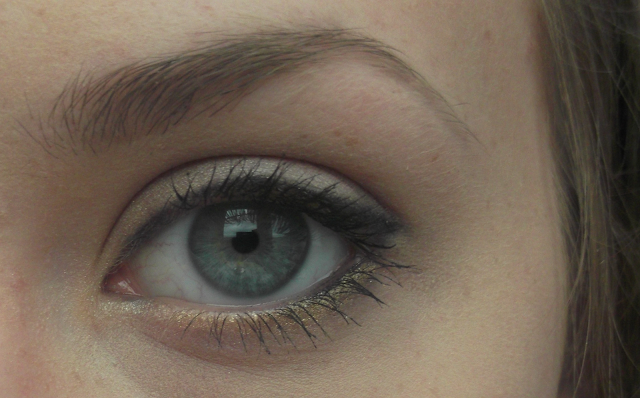 To line the lower lashline, I used Half Baked - a strong gold shimmer, which I thought completed the entire look. I saw on a post Megan did, which invlolved gold on the lower lashline, and I am now obsessed with it myself. So, thats all for todays post... well, there was actually quite a lot there if I am honest! What eye products have you been loving recently? Sometimes, we need to relax and have no stress for a few days. I did just that in this past few days when I visited Ayia Napa in Cyprus for 10 days. It was great. The B-E-A-UTIFUL view from my hotel room! Besides the fact that I witnessed kids eating their own bogeys on lilos in the middle of the pool, I think I broke my toe, and that 3 times we ordered drinks, something went wrong - the good points definitely outweighed the bad on this holiday. Looking a little damaged after a few days.. This kept me company on the plane! See what I did there? I've tanned up, besides wearing factor 50 SPF, and now the Maybelline BB Cream matches me. I'm happy. I'm not one to burn, I just go brown. I also bought some great presents for my friends, and also for myself - I'm a sucker for tourist shops, and I have no problem with buying cheap tat at times, I find it fun. Over my holiday, I got to my goal of 75 followers, only to remember that GFC is soon to be leaving, so click that bloglovin' button over there at the right, if you would like to stay up to date with The Beau Bow! Flowers in the middle of the motorway? We hired a car for 3 days, and saw many, many sights. We went to the mountains in Troodos, and we visited the capital - Nicosia for a day, and also crossed over to the Turkish side of the country, it was fun. We also explored Ayia Napa a bit, visiting a few pretty beaches, whilst trying not to get caught up with some of the people who were on their path to only one place - the clubbing square. I avoided that area, we walked through once, but only at a safe hour, where there wasn't much going on. The hotel was lovely, and it was my first all inclusive experience. It was great. I could walk up to the pool bar, the restaurant buffet, or the snack bar, or anywhere in the hotel that served food/drinks, and get it without incurring any costs. The staff were so friendly! I spent quite a lot of unexpected time in the pool, because of the extraordinary temperatures, reaching up to 32 degrees one day! Overall, I had a great holiday, and now, even with not a lot of sleep due to a late night flight home, I am ready to start posting again! I hope to do more of these 'lifestyle' kind of posts, as I really enjoyed writing this one - let me know if that is something you would like to see! Off on Holiday - 10 Days of No Posts? As you may already know, I am off on holiday today/tomorrow, and I am really quite excited about it. With all the stress of packing and last minute rushes to the shops, I haven't had time to write any posts to publish while I am there or to have any time to organise guest posts. Then I sat, and thought to myself... I want this to be a holiday, full of relaxation and stress free. Nothing like tapping my foot in the hotel lobby while waiting to try and publish a post using the WiFi, or trying to manage an email inbox full of bloggers wanting to guest post. So, I hope you understand, that we all need a break, and I will be back very soon (10 days! ), and I should be posting then! Would you like to see a 'lifestyle' type post if I collect lots of pictures? Thanks for reading, and if you are new here, please follow, I am trying to get to 75 by the time I am back! Just a sneaky peak of an OOTD coming in the next couple of weeks! So as you know, a few months to a week ago, I did a giveaway with some of these products, but I was also given one of each to try myself. I wanted to try them out properly so I could give you guys an in-depth review, and I could really tell you if they have worked or not. If I am honest, this is the one product that I find does the least for whats already on mny skin, out of this range. It helps, as I find it really good for preventing more blemishes from popping up overnight. As far as clearing current blemishes and fighting marks, not so much. Redness is reduced a small amount, but nothing really noticeable. This is my favourite of the range. You can use it daily as a face wash, or use it 2-3 times a week as a mask that you leave on for a minute. I have used it as a wash 1-2 times before, as I prefer to use it a couple of times a week for the mask, as it is much more effective on the skin. I find following on from using this, my skin will look a lot better in the morning. The redness is reduced, and the blemish size has slightly decreased in size. I find that the scrub is abrasive enough to combat my blackheads and things, but doesn't feel too harsh on my skin. I think this has a little bit of an effect on my skin, which is a light loss of reddness and size in blemishes. I don't really like the texture of this scrub as much, I find it quite thick, and so hard to spread out to be able to get a good scrub on all areas of the skin, but I work with it the best I can, and haven't had any major problems. Overall, I will recommend this range to anyone who has a combo/oily and possibly normal skin, and is prone to breakouts or blemishes. I won't recommend this to anyone with a dry skin, as the bottle does say that is may cause drying, due to fighting the blemishes and the ingredients. Have you tried anything from this range, let me know what you think! I am off on holiday tomorrow, so you may see a break from me, or if I can get some WiFi access, I may be able to post - but every blogger needs a break! Can we get me to 75 followers in the 10 days I am gone? Thanks for reading, come again soon! So, as you know, I am on a spending ban, and the reason for that is... I am going shopping with Megan in just under a month, so I need to save my monies, otherwise I will have a few pounds against her birthday money! ;). So, I would like to get a few beauty things, and some of which are going to be in todays post! If I want more things in the future, I will do a part 2. I have wanted a good toner for my skin for a while now, and as I never see a day without blemishes, this may help to clear them and soothe them, as it is tea tree. I'm not going to buy the hefty badboy, as I want to try it out first. So, I have heard these being talked about for a while now, and sadly, I still haven't hopped onto that bandwagon. I will be shortly though, as I would like to try this caramel scented/flavoured one. Mmm! For £1.99 that isn't bad at all for a lip balm, and the tin is quite slim, so easy to carry around. Okay, so when I saw this was released, I knew I wanted it instantly, but I held onto the temptation, and have waited until now, I saw that the Mega Plush mascara is now released in the UK, which I was really excited about, but I like waterproof mascara, and they don't have that, so this will be fine for me! So, what is there to say about this product? You probably all know about this polish, as it is so highly raved about on the internet, through YouTube and blogging. It is just a colour that I would wear all the time, and probably repurchase, as it is so pretty! This is a bargain. I love the Rimmel blush I own, and I want something a little brighter and more colourful for the current upcoming seasons. It just looks so pretty! I don't feel like I own a blush like this, as most of my pinks are either bubblegum, or super bright, whereas this is on the dustier side of things. At the moment, I am all about the sticks. Everyone and their mother is coming out with some of these, from Revlon, to Clinique, to Laura Mercier, to MUA. For £3, I cannot pass this up. I did swatch this in the shop I think and it was really nice. This is what I call a bargain. So, that is what's on my wishlist, but I would like to know what is on yours in the comments! Thanks for reading, don't forget to follow, using all the buttons to the right, and I will see you in my next post. As you know, GOSH is a brand which I am pretty obsessed with, the nail polishes, and the makeup! The quality of their products is outstanding! These lip glosses are really nice, and they give a nice sheer amount of colour to your lips, so I like to wear these for school, as they are very wearable, and don't look like too much. The shades I won are 04, and 07, I don't know the colours (sorry! ), but there is a sheer red, and then a sheer browny colour, which sounds horrible, but looks great. I don't know if I am right on the scent here, but I am pretty sure they smell like the Fruit Salad flavoured Chewits sweets! YUM! Here you can see that the colours are pretty sheer, maybe a little more pigmentation would be better, but otherwise I really like these products! I think they have quite a good lasting power too! This picture was just to show the applicator, which is a doe-foot, making it very easy and quick to apply, so I like to take these on the go with me! Have you tried these? Let me know in the comments! Hi guys! If you are a frequent reader of my blog, you may or may not have noticed, that my layout and logo has changed! I have spent yesterday and this morning tweaking with things on the layout, to make it look more professional, and I am really pleased with the effect! I wanted a simple logo, as I was so used to having one with the coloured background. The white is more easy on the eye, which I like. 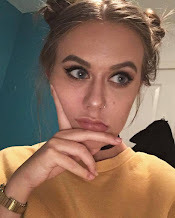 I also have made most of the things on my blog a browny/'sepia' effect, which normally I would avoid, but I wanted by blog to be neutral, so it would compliment the pictures on my posts. Let me know what you think of all this new layout and logo stuff on my blog, what you have seen before, was only temporary until I finally found something I liked - and I think I found it! Anything that changes on my blog from now on, will be only minor little tweaks, nothing that will make a huge difference. Thanks for reading, leave your thoughts below! I love Topshop, but I only own a couple of items. This is soon to change though, as hopefully I will pick up something when I go birthday shopping with Megan and her mum. Go wish her a happy birthday in around a month! So, with me saving, the second best thing then shopping, is a wishlist, and that's what this post is for today! Look at all these beautiful things! I tried to get a mix of all the categories. Most of these are from the 'new in' section, so they will all be available, if you are interested. Everything is linked, so you can go and have a look for yourself, and see everything on the models, because they look a lot nicer! This is a new product in the Topshop makeup line. I think these are like the balm stains everyone and their mothers are coming out with, but more like a lipstick form. The colour is super pretty, and I would definitely wear it a great deal in spring! This. Spring/Summer in a top. I don't like to wear crop tops, but on the model this looked great, and with something high waisted (disco pants be mine), it wouldn't show of much skin at all. Because it is knitted, I think it takes the thought of it being cropped is out the window. These disco pants, are the one thing I WILL be buying when I go shopping with Megan. She has ordered some online, so as long as I get the all-good from her, about the quality and the fit, they will be in my shopping bag in a matter of seconds. Fingers crossed they have my size! A satchel is something I always have me eye on, and this one is more summery than your common black/brown. They also had an orange, a white and an bright colbalt blue colour. I liked the yellow/lime, as it was a less harsh colour than the other ones. I often find myself watching the Cambride Satchel advert, and I think that inspired me to want to buy one for myself! I expect that this will be pretty good quality, and for £28 it's not bad! Finally, some shoes. I really like the gladiator type sandals, but I don't think I could pull them off if they went up to/past my ankle, so these ones are a more dainty subsitute. On the model, they look so pretty, and I think I could wear them with skirts, dresses, and even jeans. They are a really versatile pair of shoes, and the studs add a nice bit of detail on them. So, that's my wishlist, let me know if there is anything you are lusting after be it from Topshop or somewhere else! I would love to know - it might make me want to get it! Thanks for reading, don't forget to follow, via Bloglovin' and GFC, and also on twitter. Why haven't I blogged about this product sooner. Why. Why. WHY. It's incredible, and it really lives up the the hype it gets on the internet. 12 shades, of beautiful, highly pigmented, neutral (high end) eyeshadows, in one place, all in lovely packaging for £36. For a high end palette, that totals up to be £3 per eyeshadow. 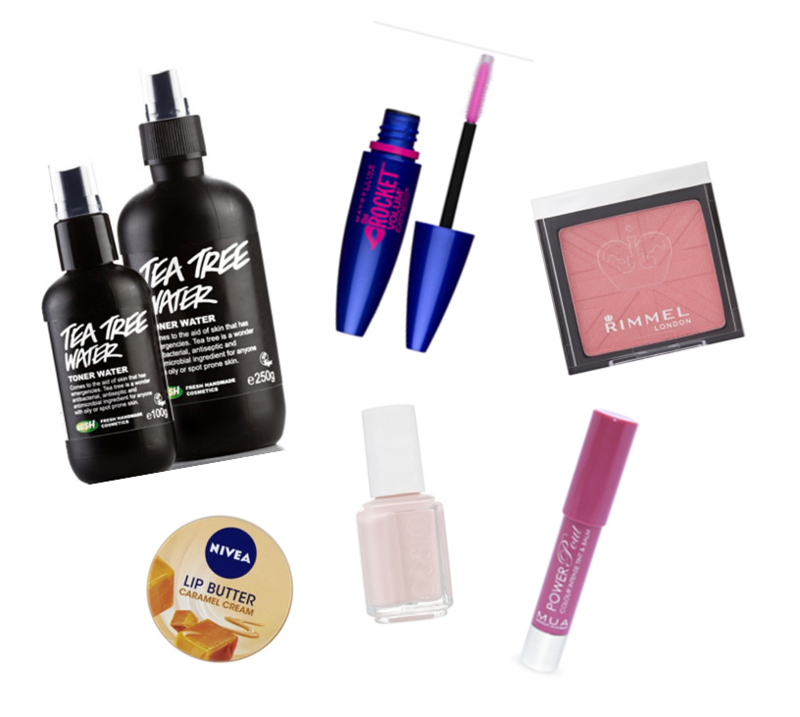 Better than MAC, and quite a few drugstore brands too! So, I am just going to show you some images of the palette, and then I will have swatches of each colour too. These are all such wearable shades, which is why I like it so much. I have become attached to neutral shadows, and I find that I can get many looks out of this one palette. On these swatches, I literally swiped my finger once or twice over the pan, and this shows how good the pigmentation is. L-R (top and bottom pictures) - Suspect, Pistol, Verve, YDK, Busted, Blackout. My favourite shades are YDK, Bootycall, and Suspect, and I also love Tease for the crease, and it also is pretty good in my eyebrows! What are your favourite shades if you have this or the Naked 1, I would love to know!